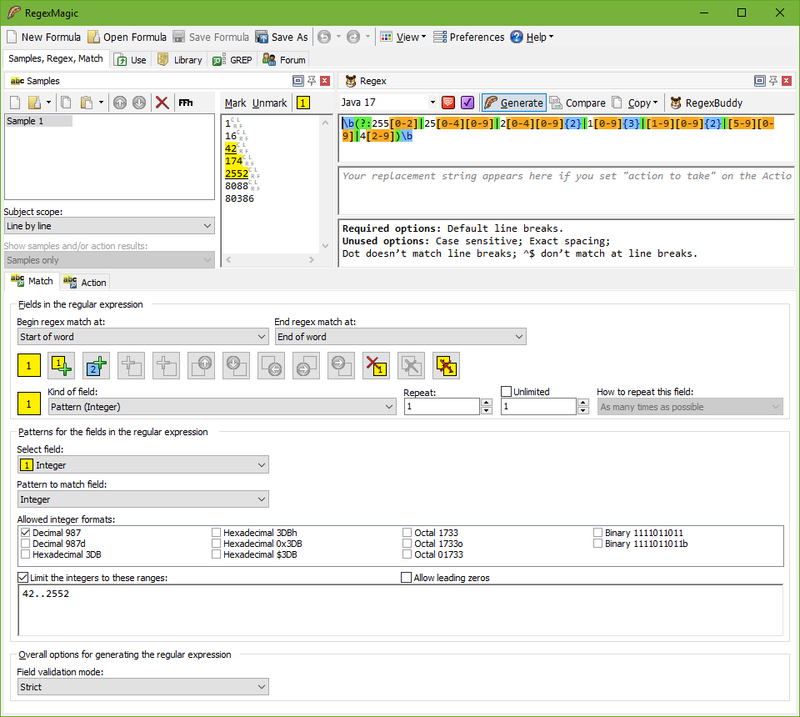 RegexMagic makes creating regular expressions easier than ever. While other regex tools such as RegexBuddy merely make it easier to work with regular expressions, with RegexMagic you don't have to deal with the regular expression syntax at all. RegexMagic generates complete regular expressions to your specifications. Regular expressions only deal with characters, one at a time. Instead of saying "match a number between 1 and 12", you have to say "match a digit between 1 and 9, or a digit 1 followed by a digit between 0 and 2". With RegexMagic you can work directly with higher-level concepts such as dates, numbers, or email addresses via RegexMagic's patterns. Using the integer pattern, you can tell RegexMagic to match a number between 1 and 12, or between 42 and 2552 as the screen shot shows (and look at the length of that regex). By combining as many patterns as you need, you can generate a regular expression that matches anything you want. RegexMagic doesn't automatically generate regular expressions on magic alone. But it sure makes things a lot easier by allowing you to work with your data instead of the cryptic regex syntax. When creating regular expressions, you often have to choose between creating fast and simple regular expressions, or complex and accurate regular expressions. When using a regex to search for dates, should the regular expression make sure to exclude February 30th, or is anything in the form of 99/99/99 acceptable? With RegexMagic, generating loose and strict regular expressions is equally easy. RegexMagic's patterns provide a wide range of options to strictly match what you want. If your regex turns out to be too complex for your target application, one setting is all it takes to tell RegexMagic to loosen up and generate a simple regex. Easily create regular expressions using RegexMagic’s patterns, instead of the cryptic regular expression syntax. Best of all, RegexMagic supports nearly all popular regular expression flavors. Select your flavor, and RegexMagic makes sure to generate a regular expression that works with it. RegexMagic can even generate snippets in many programming languages that you can copy and paste directly into your source code to implement your regular expression. With the built-in grep, you can use your regular expression to search through large numbers of files and folders.